Kos - Κως lays at the mouth of the Turkish Gulf of Kerme, which cuts deep into the coast of Asia Minor. It was separated from the Bodrum Peninsula by the collapse of a rift valley in the Pliocene period, which explains the range of limestone hills, rising to 846 m in Mount Dikaios, that runs along the island for almost its entire length. It is the largest island in the Dodecanese after Rhodes and, unlike most other Aegean islands, Kos has a population that is increasing in numbers. Naturally, most companies run a yacht charter base on Kos. Yiali (Gyali) is an obsidian island, which houses an ugly pumice quarry. The origin of this pumice is the Volcanic island of Nisyros (a big strato-volcano, which was built up above sea level about 66,000 years ago). It was occasionally active in the Middle Ages but now manifests itself only in the form of solfataras. Pumice from the eruptions may be found in 100m thick beds on the higher parts of the island and is exported. You might want to look now at the Glossary of Volcanic & Geologic Terms. 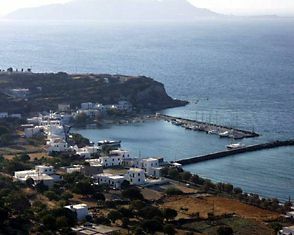 Nisyros - Νίσυρος is a green and well-watered island, with fertile soil which is cultivated on laboriously construced terraces on the outward-facing slopes. 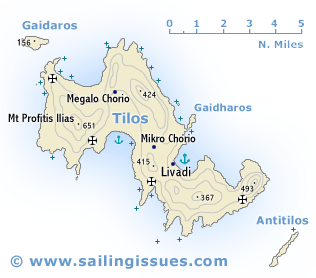 Yet, Tilos - Τήλος (Italian Piscopi or Episcopi) is a bare and rugged island, which is rarely visited by tourists and yachties. Near Livadia, the island's port, are the ruins of a Venetian Castle and the Kharkadio Cave, in which the bones of prehistoric dwarf elephants were found. Kos has been well populated since Neolithic times. About 700 BCE, together with the five other cities of the Hexapolis (Knidos, Lalysos, Lindos, Halikarnassos and Kamiros), Kos was an outpost of the Dorian League. The island was celebrated for the oldest cult site of the healing god Asklepios and for a medical school of which the most famous representative was Hippokrates (5th c. BCE). 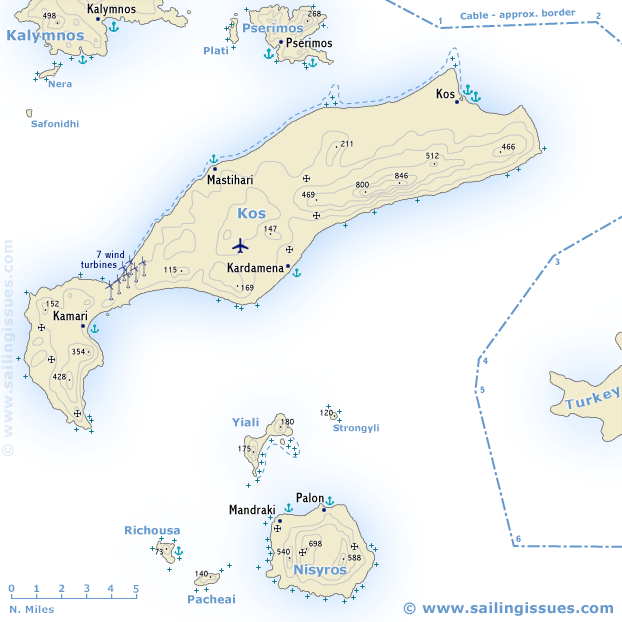 Nisyros was originally settled by Dorians from Kos and Kamiros. In 1312 it was occupied by the Knights of St John, and later became a fief of the Assanti family. It was taken by the Turks in 1533. 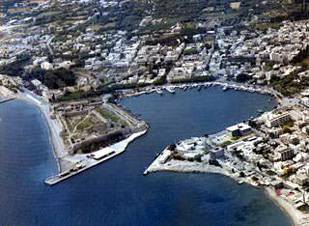 Kos Port is located in a large shallow bay; in the approach the north cape should be kept at a distance. 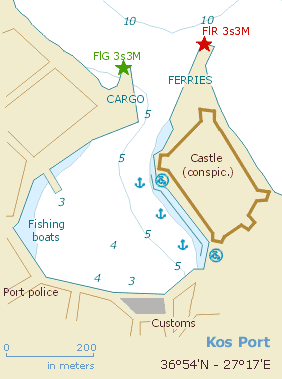 The west side inside the harbour is for charter yachts only. 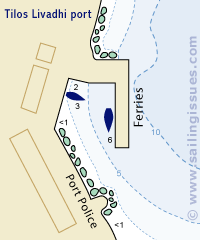 The east side - under the Castle of the Knights (1450-80) and matching palm trees - is the mooring area for visitors. Kos town is full of bougainvillea, jasmine and exotic whiffs of the middle east. Tilos has been one of the best-kept secrets in the Dodecanese for some time, with good unspoiled beaches, friendly people and wonderful walking country: a tranquil antidote to Kos town. From a distance it looks arid but it shelters groves of figs, almonds, walnuts, pomegranates and olives, all watered by fresh springs. In Mandraki - the capital and port - life revolves around the cafetaria on the quay and despite tripper boats from Kos, this higgledy-piggledy town retained its charm. Futher along the coast is Pali or Palon, a lovely fishing village with excellent shelter. Masses of pumice stones can be found bobbing in the harbour. Interesting beaches all around the island in various colours are ideal lunch stop anchorages. Near Mandraki itself you can explore some ancient walls - 5th century BCE - which were part of the acropolis of the island. Above: Looking north from Mandraki town; left Yiali; right Stronghilo; Kos in the distance. Yiali island in the distance.